Opening: May 8, 2008, at 8:00pm, with the artist. 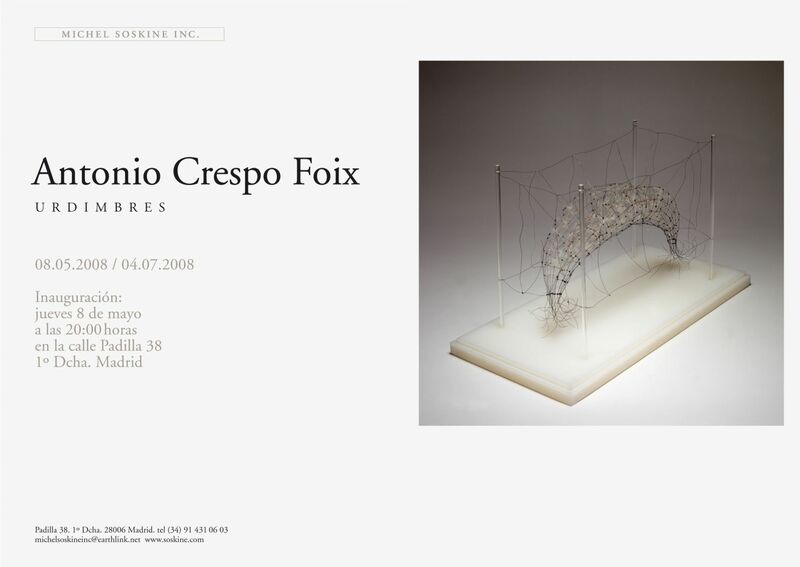 Since his last exhibition with Michel Soskine in 2005 Antonio Crespo Foix (Valdepeñas 1953) has continued to develop his work in sculptural philosophy and maintaining his presence in different international arts fairs. His work was recognized with the CCM Prize for Sculpture in 2007. Urdimbre is the “combination of threads that are placed in the fabric that makes the material” and Crespo shares this definition through his threads of wire, metal or pins that go to form this organic fabric. In this exhibition he has brought together a collection of work in two and three dimensions which have in common the concept of the search for and the exploration of levity. But Urdimbre is also the “action of constructing something” and in the same way Antonio Crespo constructs a certain mystery and spirituality with his work. His work, which is very personal and difficult to define is of “poetic nature”. His sculptures, in different forms and sizes, are fabrics with wire and pins, cotton and hemp, etc. Together with the Light they form a fundamental part of his work giving a silent physical presence to the sculptures. Bonet defined him as having the ability to “write in the air” and J. L. Loarce as “turning it into geometry”. At the same time F. Huici talks about “the elusive poetry” pointing out the the shadows, the mist and the smoke as the substance of the work of Antonio Crespo Foix. The work is simple but artisanal, mature and sensitive and poses a finished quality and an elegant geometrical analysis. It is through these shadows and mists, as they appear to us as a metamorphosis, that the other fabric weaves silently and tirelessly the human existence, its dreams and its life.